For the 10 gazillionth time...there is no helium shortage. There is plenty of helium. What there is is lack of production systems. The US dumped a crap load on the market which essentially drove producers out of the market. Now that its starting to be scarce you will see producers start to process, store and sell it at more reasonable pricing. Which is true? What are the facts? Is there really a worldwide Helium shortage, and are we at risk of running out of a non-renewable resource forever? Firstly, we need to consider the different isotopes of Helium differently. After the terrorist attacks of September 11, 2001, the federal government began deploying neutron detectors at the U.S. border to help secure the nation against smuggled nuclear and radiological material. The deployment of this equipment created new demand for helium-3. Use of the polarized helium-3 medical imaging technique also increased. As a result, the size of the stockpile shrank. After several years of demand exceeding supply, a call for large quantities of helium-3 spurred federal officials to realize that insufficient helium-3 was available to meet the likely future demand. The paper goes to discuss policy decisions and alternative sources that may need to be found to increase supply and reduce demand. 99.999863% of the helium found in the atmosphere is helium-4. Helium-4 is mined - it is refined from natural gas. The bottom line in terms of helium supply is that there is very little excess helium refining capacity, and domestic supplies of crude helium are growing ever tighter. But the reason given wasn't that we were running out of Helium, but that there was a privatisation of the Helium supply by the USA (and corresponding reduction in stockpile), combined with delays in bringing up new factories and outages with existing ones. The short answer is that demand is up and several overseas helium plants that were expected to be up and running in 2006 were delayed and down. Throw in things like the New Year’s storm in Kansas and Oklahoma that damaged power lines to two major refiners, and scheduled plant maintenance at other U.S. helium facilities, and Houston, we have a problem. These are obviously short-term problems. Zhiming Cai, Richard H. Clarke, Bartek A. Glowacki, William J. Nuttall, Nick Ward, Ongoing ascent to the helium production plateau—Insights from system dynamics, Resources Policy Volume 35, Issue 2, June 2010, Pages 77–89. 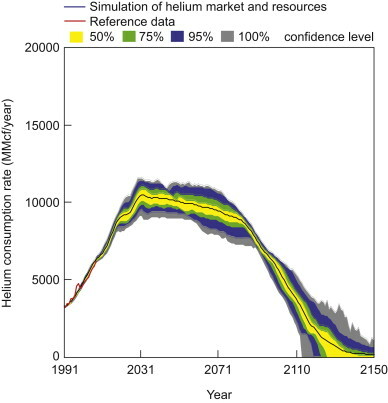 This paper contains an economic model predicting the supply and demand of Helium over the next century, under a range of scenarios. They do predict first a plateau, and then a decline in supply. 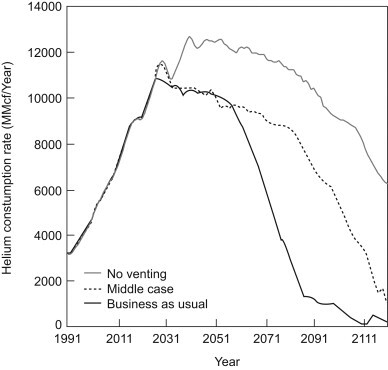 The model indicates that improving resource exploitation strategies might extend a production plateau that emerges in the 2030s. They also predict that the wholesale price Helium will peak (in real terms) at about six times its 1991 levels. Obviously, predictions 100 years into the future need to be treated with a grain of salt. (For example, who would have predicted the sudden increase in demand for helium-3 after 2001?) Nonetheless, even after accounting for increased prices making less efficient supply methods become profitable, this model predicts that Helium supplies will dwindle in 100-150 years. This is actually a surprisingly difficult question to answer for a variety of reasons and it seems that the best answer is that yes there is a shortage of purified helium reserves, while at the same time it appears that maybe but likely no there is not a long term shortage of helium in any meaningful understanding of what a shortage is. First, some background is necessarily to see why this might be the case. Helium is recovered from natural gas and specialized equipment is sold this process. This equipment is advertized to generate about 99.999% pure gas with the quantity being dependent upon the particular field that it is being extracted from. This leads us to the modern problem; historically, helium was a waste gas from natural gas wells and was released into the atmosphere. However, in the United States helium was eventually considered a strategic resource that was worth stockpiling and conserving. This in turn lead to the National Helium Reserve which was built up due to the Cold War; however, has been in the process of being phased out due to the costs associated with maintaining and storing helium in the reserve. The purpose of the "Helium Privatization Act of 1996" appears to have been to transfer the ownership over to private industry, but nobody appears to really have stepped up to build up their own stockpile so it's been getting sold cheaply on the open market. However, it is probable that production from Cliffside Field will continue to supply the helium needed to help meet worldwide helium demand indefinitely. Which is an interesting thing to say if you are concerned about running out of something! The problem I've been running into though has been finding out exactly what the annual worldwide consumption is which is a good indicator for if you are running out or not. While fairly recently summaries of the production and reserves are fairly easy to find (January 2012), determining the exact worldwide consumption rates is harder. However, I have found quite a few articles discussing the matter citing the potential for a 300 year reserve but nothing really definitive and searching has found that new gas fields are being opened up and just now getting exported so the exact world reserves are still speculative. So to summarize, while there is a shortage of purified helium, largely due to the policies regarding the National Helium Reserve, there doesn't appear to be much evidence of a critical worldwide shortage that is cause for major concern. From what I have been reading one of the larger concerns is not so much how much helium is in the ground but rather the availability of it being inconstant if the major reserves are shutdown. Is helium being “wasted” on party balloons? Was there a downturn in the South African economy after the end of apartheid? Were there 600 millionaires in Gaza in 2014?